This book is written at an approximate level D. Many sight words are used to support early readers as they begin to read nonfiction text.The complete text of the book is included below, so you can see if it will meet the needs of your students. 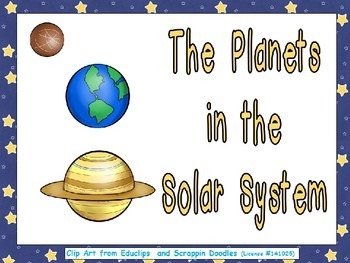 Page 2: The sun is in the center of the solar system. 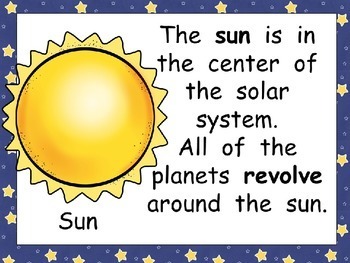 All of the planets revolve around the sun. Page 3: Mercury is the smallest planet. It is also the planet that is closest to the sun. 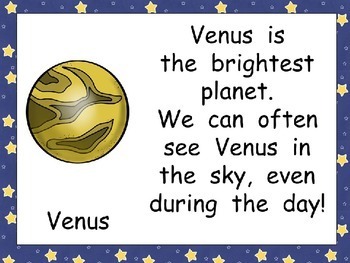 Page 4: Venus is the brightest planet. We can often see Venus in the sky, even during the day! Page 5: Earth is our planet! It is the only planet with living things on it. 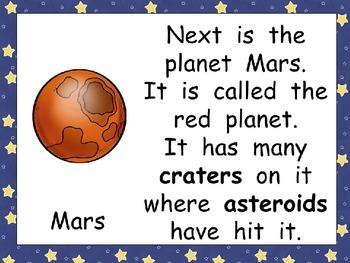 Page 6: Next is the planet Mars. It is called the red planet. It has many craters on it where asteroids have hit it. Page 7: Jupiter is the biggest planet. Jupiter has the Great Red Spot, which is a big moving area of storms. Page 8: Saturn is the sixth planet from the sun. It has big rings which may be made of ice. Page 9: The planet Uranus is blue. It has rings, like Saturn. It is not as big as Saturn. Page 10: Neptune is blue, just like Uranus. You have to use a telescope so you can see it in our sky.